Today I am sharing one of those projects that hits all the sweet spots. 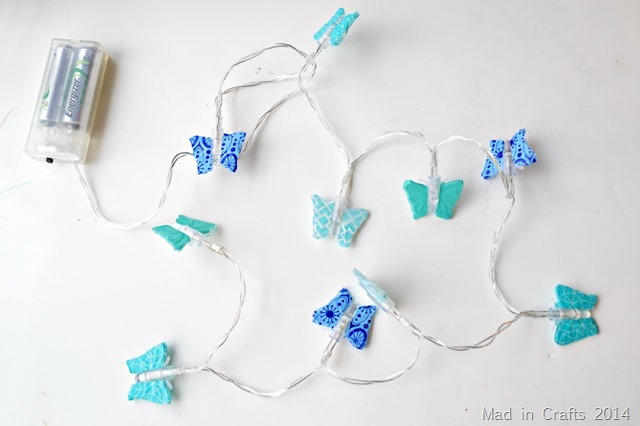 It’s inexpensive, quick, and easy to make, and the final product is adorable! 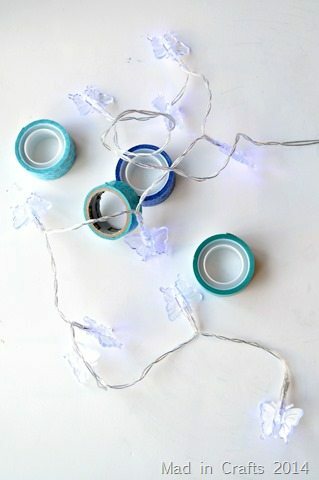 I promise that even the most novice of crafters can make these washi tape fairy lights and get great results! Watch this short video to see how to make these lights or scroll down for the step out photos. Subscribe to my YouTube channel for other fun videos like this! All you need for this quick project is a string of LED butterfly lights from Dollar Tree, some washi tape, and scissors. I used Scotch brand tapes, but DT also sells knockoff washi tape. They don’t always keep it in stock, though, so keep your eyes open for it. The LED lights are great for a washi upgrade since they don’t get hot even when they are lit for a long time. The string from Dollar Tree is for indoor use only, which is just fine since the washi wouldn’t hold up to moisture anyway. 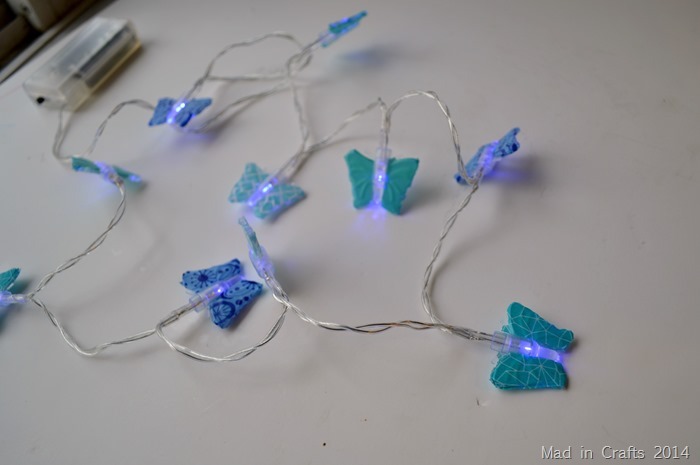 The LED lights in this strand are a cool blue color, so I chose tape colors that would complement them. To decorate the butterfly lights, just wrap a piece of tape from the front of the butterfly wing to the back. Press the tape firmly in place. Repeat with the other wing. 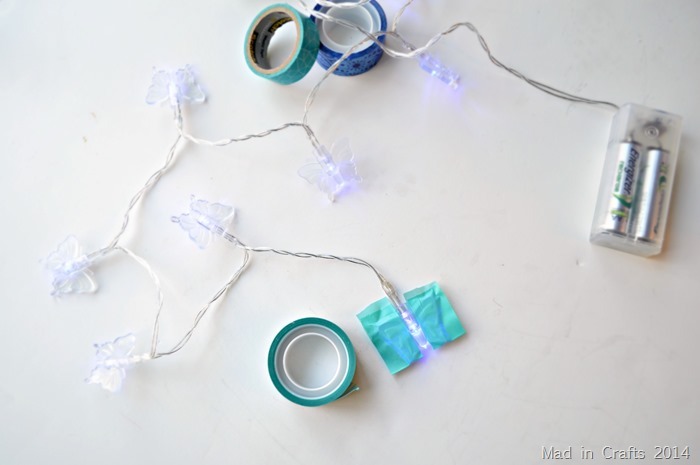 Then use your scissors to trim off the excess tape. Repeat for all of the butterfly lights. I chose to use four different patterns of tape, but you can use as many or as few as you would like. 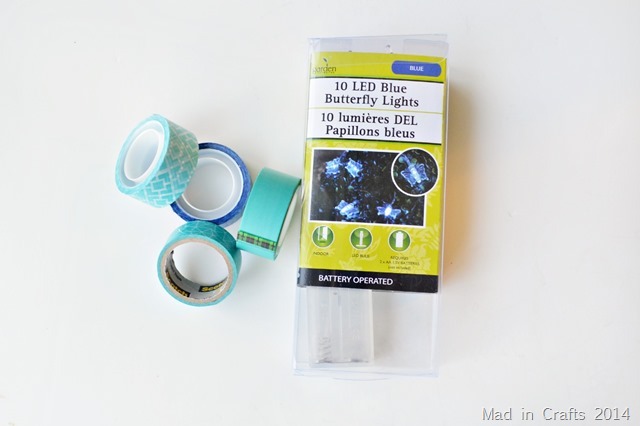 The butterfly bodies still light up perfectly, while the tape adds some extra color. 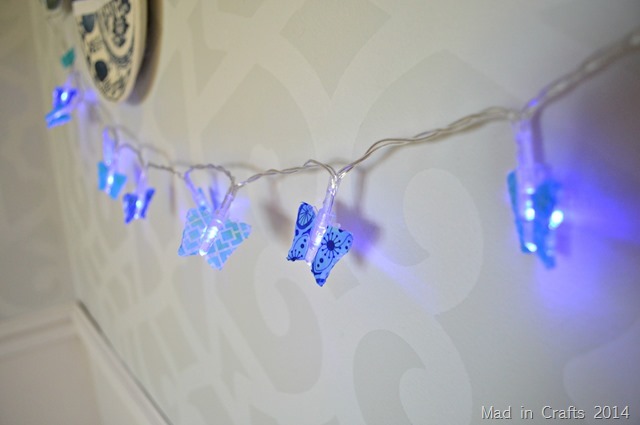 With the washi tape added to the fairy lights, they look beautiful in the daylight or lit up in the dark. These lights would be very pretty taped up in a girl’s bedroom, or they could be added to a wreath or vase since they are battery powered. 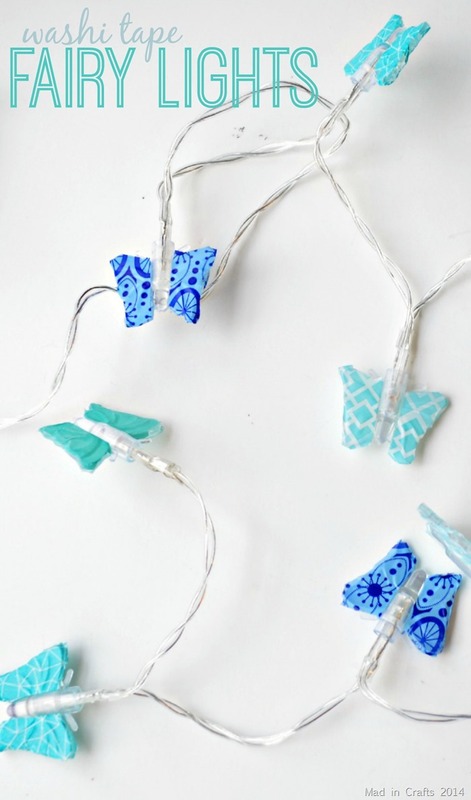 Where would you hang a string of these pretty fairy lights? Gabrielle, you can feature the post and use one photo as long as there is a clear link back to this page. Those are pretty standard rules for featuring blog posts.